We all loved taking on little construction projects when we were kids, from school science projects to just building a tree house in the backyard. However, as we’ve grown up and struggled into the world of adulthood, we’ve started to lose our passion for construction and all the little details we used to be obsessed with. Nowadays, we’ll get a job out of the way as quickly as possible just to get it over and done with. Let’s be honest, bike lanes are great in theory – but do they ever really work? You always have people walking in them, cyclists zig-zagging through them, and it all becomes one helluva transportation mess. However, the one good thing about bike lanes is that it is quite fluid and you do have the ability to move around from one lane to the other (even though you’re not supposed to). 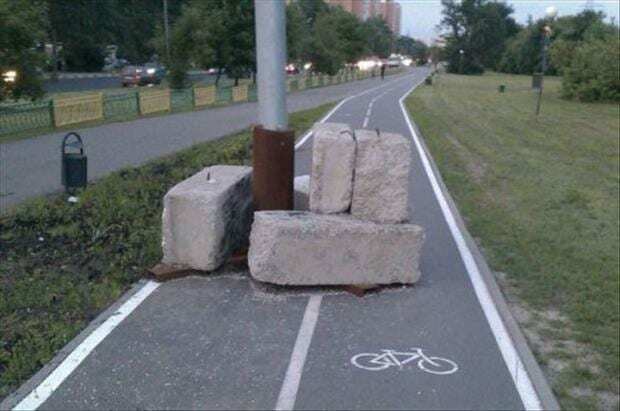 Nevertheless, it seems one construction worker was fed up with this happening and decided to put a stop to it once and for all. We bet he’s a cyclist. As The Supremes once sung, you need to ‘Sotp in the name of love’…or in the name of construction. At first glance, this piece of road lettering looked completely innocent and perfectly formed, and we were ready to put our foot on the brakes and stop at the junction. Because that’s what you do at a STOP sign, right? However, on closer inspection, we don’t know what the heck we’re supposed to do. Do we stop? Do we go? Are we expected to perform an interpretive dance? Come on, man. 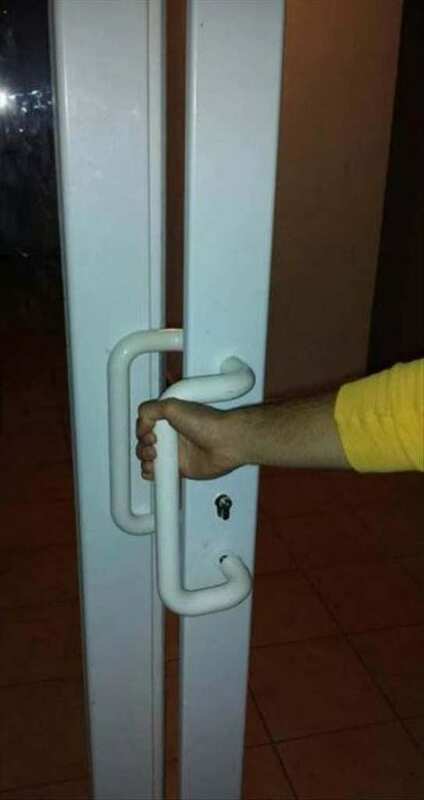 You had one job. Yep, you’re thinking what we’re thinking. This is the kind of door you’d see in a horror movie, and one that would allow all kinds of ghosts and ghoulies into our lives – but don’t worry, we’ve got Scooby-Doo and the rest of the Mystery Incorporated crew on speed dial. 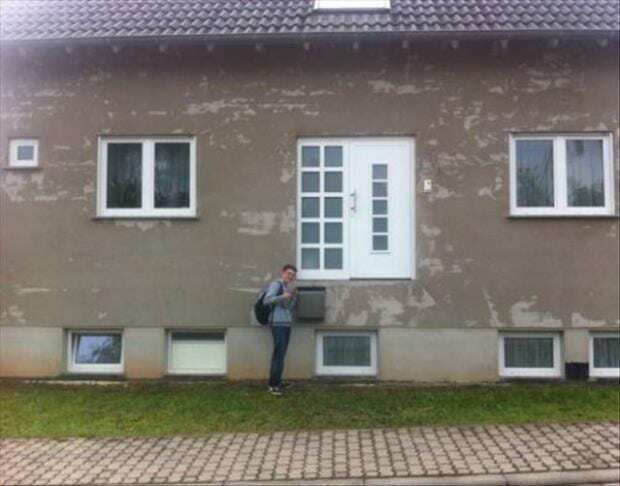 Nevertheless, we do have a few questions regarding this door. One: how do you open it? Two: what is its purpose? And three: how did the construction workers not realize there was a *teeny tiny* issue with their handiwork? Normally, your front door is located on the ground floor, and all you need to do is simply walk out and greet the world (hi world). Simple, right? Well, there are some houses that have doorways on upper levels – and of course, it makes sense to allow the homeowner to exit their homes and walk down a set of stairs or decking to actually make it down to Earth. However, whoever built this house seemed to have forgotten that key element. The guys inside will either have to jump or climb through the tiny windows down below. Awkward. If you’ve seen the incredible Stairs to Heaven in Oahu, Hawaii, you’ll know that these stairs seem to disappear into the clouds – and it’s pretty darn beautiful. 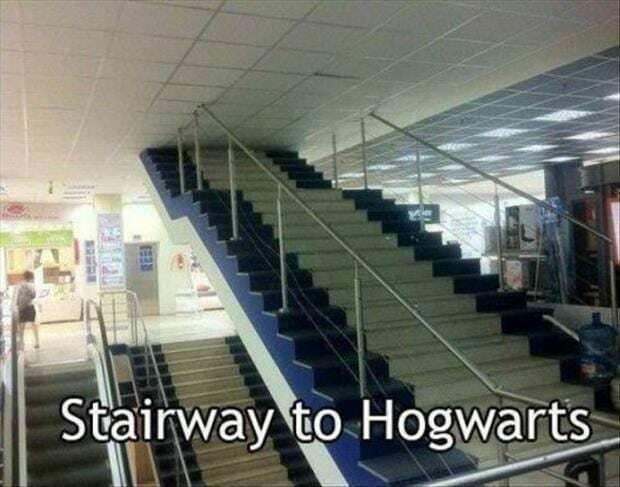 We would say that these stairs are pretty similar, but that would be a lie, and we’re not about that life. We have no idea how this situation came about. 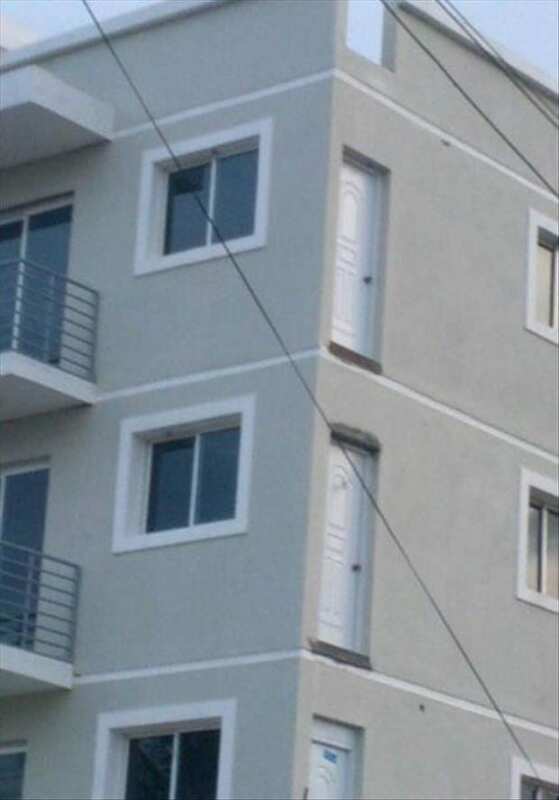 Is the door missing or is the staircase an unplanned addition? 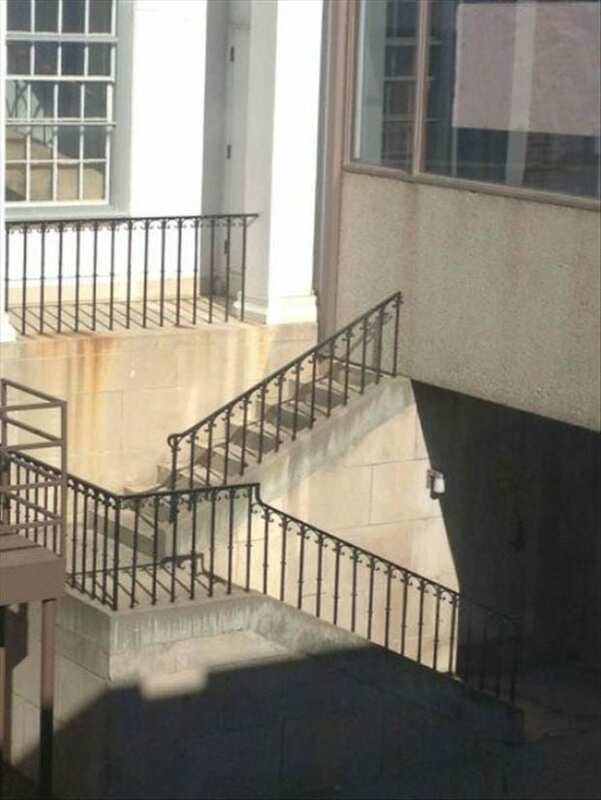 It seems we will never know, but we hope someone uses the staircase at some point. Let’s be honest, the main purpose of a road is to allow drivers to drive freely in their own lanes, without the fear of driving into oncoming traffic (because that wouldn’t be ideal). 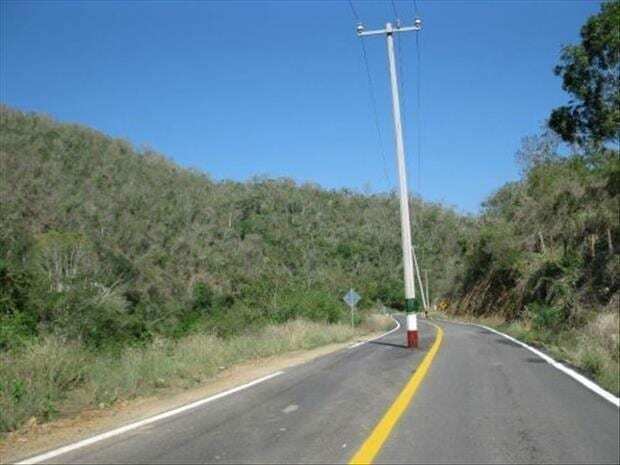 However, apparently, the construction workers who built this road and stuck a telephone pole slap bang in the middle of it didn’t get that memo. Ooops. We can’t even imagine what rush hour or the Thanksgiving holiday traffic would be like in this area. It makes us cringe just thinking about it. Don’t get us wrong, we love a good manhole as much as the next guy (well, as much as you can love manholes, anyway), but don’t you think this is a little excessive? 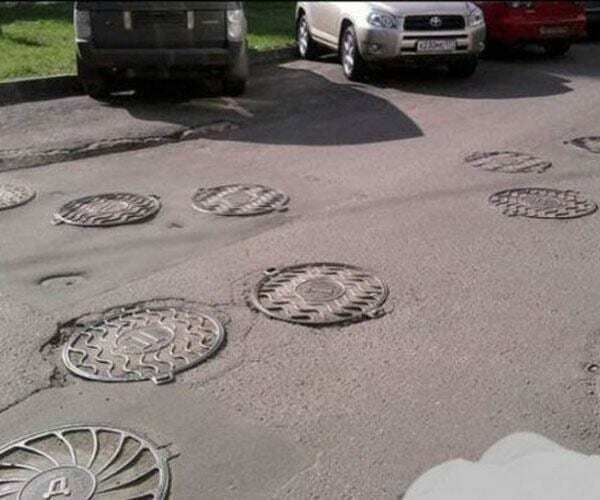 Of course, we all know that manholes are essential in today’s day and age, but it doesn’t take a genius to know you don’t need THAT many in one small area. This street looks like a giant version of whack-a-sewage – and that’s not the kind of game we want to play. Soz. Although we totally admire the work and training it takes to become a construction worker or handyman, we have to question HOW THE HECK some people got into the business – because they might want to consider their career options. For most of us, it’s a dream to have a balcony attached to our apartment – because what could be better than sipping a nice glass of red while enjoying a beautiful sunset? 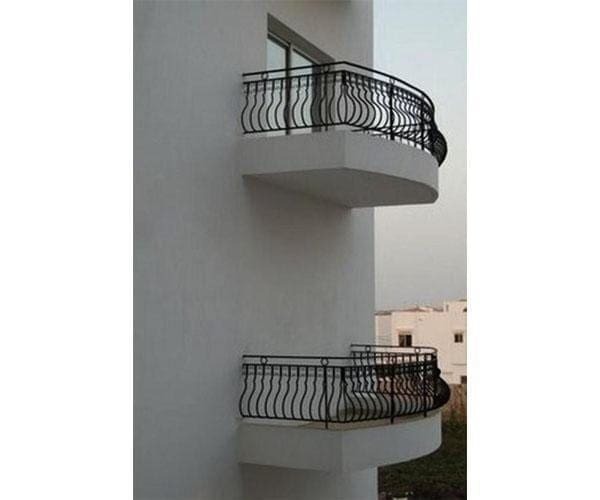 However, these guys struck gold when they realized that they had more than one balcony. Yuh-huh, they’ve also got a secret balcony that is totally unusable unless they enter into the mindset of James Bond and abseil down the side of their building. They’re living the dream, right? After buying your dream home, it’s of paramount importance that you secure your house and your belongings from pesky introducers. 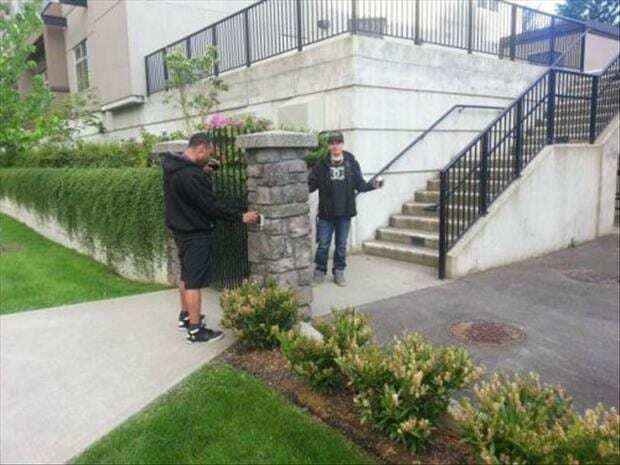 Most of the time, people will install CCTV cameras, a burglar alarm, or even protect their property by secure fences and gates. That’s what this family wanted to do – but we can’t imagine a burglar would be put off by this fence when they could simply walk over the tiny bushes and steal their loot. Unfortunately, they aren’t 20-foot trees just yet. At least they tried. Let’s be honest; we have waaaay too many questions surrounding this image. However, the main one is…what happened?! 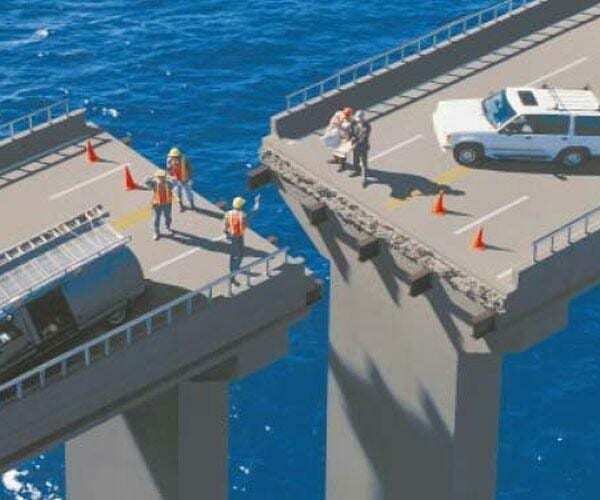 We have no idea how the architect and the construction workers had no idea that the giant bridge they were meticulously building didn’t actually meet up until the last few meters. But it’s fair to say that the guy with his hands on his head, and looking up into the air (while he realizes that he works with a bunch of silly billy’s) is feeling the exact same way we are right now. 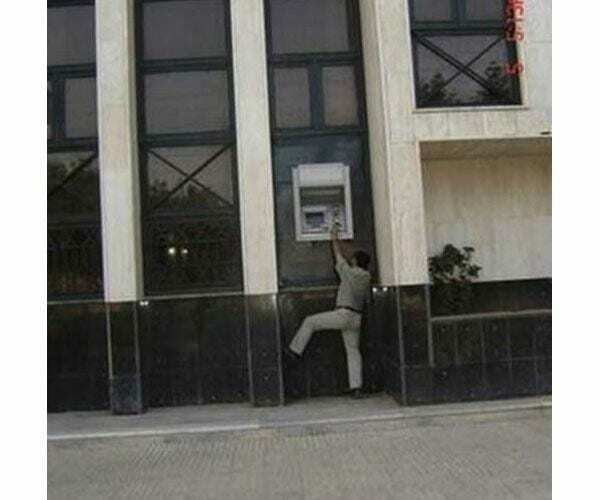 Okay, either this guy is really, really small, or the ATM machine is ridiculously high up. After much debate, we’ve decided that the ATM is just ridiculously high up – but we can’t really see how this would serve any purpose. For starters, you would barely be able to put your card in the machine. Then, there would be absolutely no way to see your account balance on the screen and don’t even think about putting in the right pin number, because you won’t be able to see it. The only conclusion we’ve come to is that this ATM is getting ready for the day when giants take over this earth. It’s fair to say that going to the bathroom and using a urinal is a pretty awkward experience, especially if there are other people in there. In fact, the unwritten rule is that you leave AT LEAST one empty space between you and the next guy – that’s just how it works. 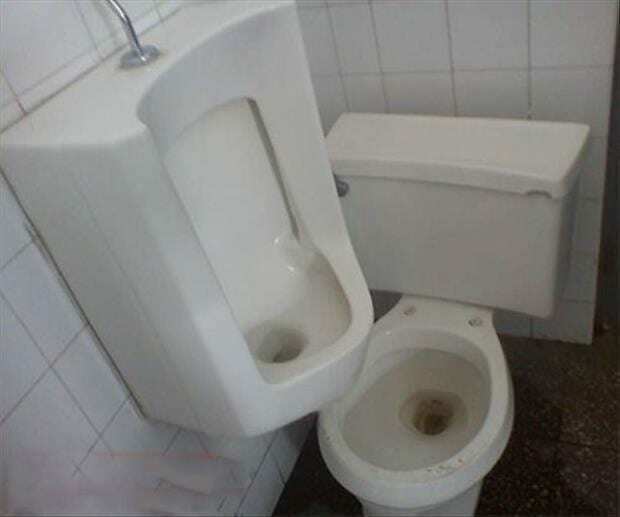 However, we reckon the architect who designed this bathroom was definitely a woman because no sane man would put these two so close together. This makes us feel super uncomfortable *shivers*. As much as this photograph pains us (where the heck is the staircase? ), we’re gonna give these construction workers the benefit of the doubt. 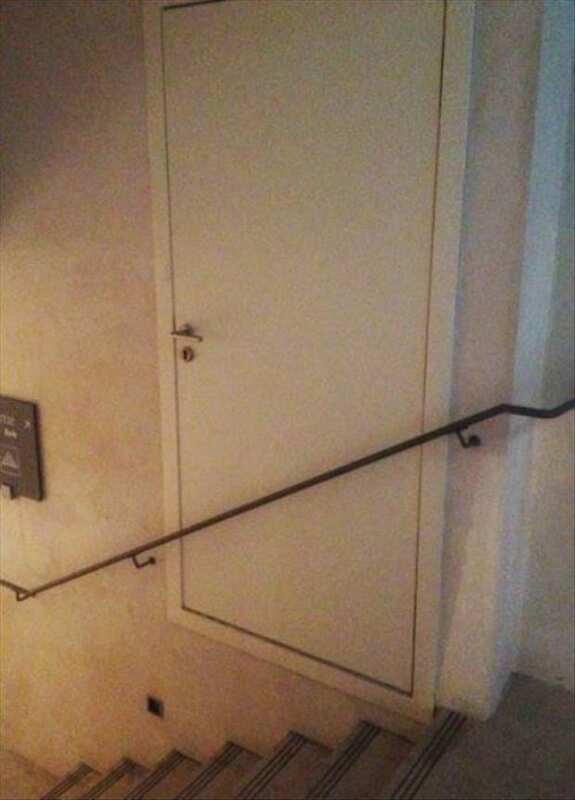 There could be a *teeny tiny* chance that this door was built for a specific purpose. 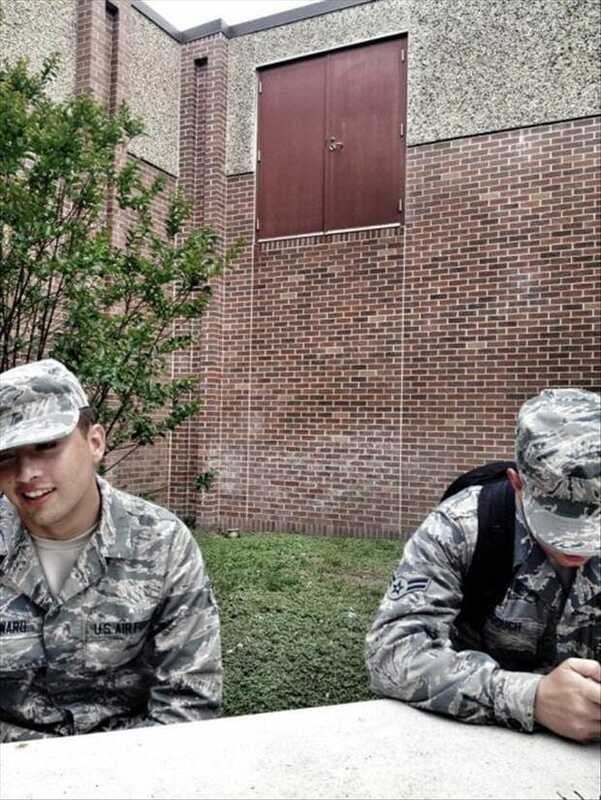 Perhaps these military personnel have to make their way to or from the door without the use of a staircase? We have absolutely no idea why this would be a thing, but we have no idea how someone could forget a staircase either, so we’re running out of ideas. 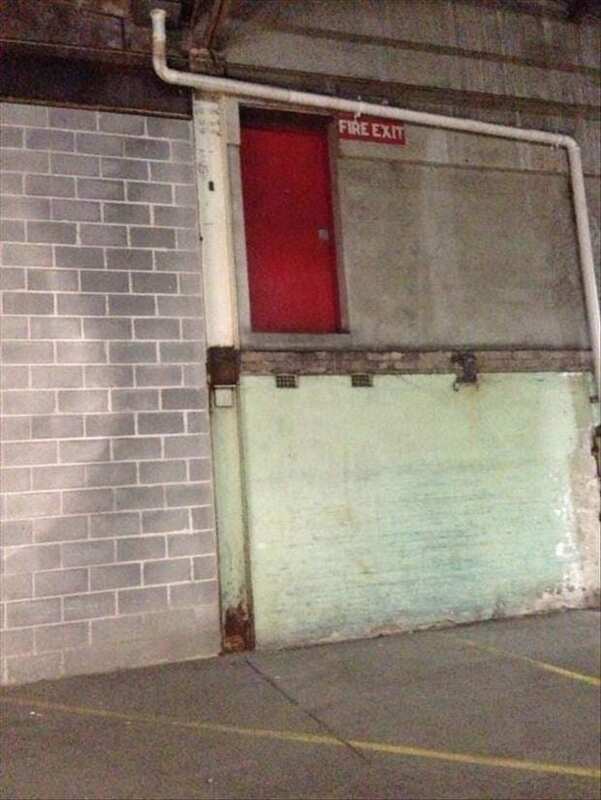 Now don’t quote us on this, but we THINK that a fire exit is supposed to take us away from impending doom and lead us to safety. However, we can’t really see how this fire exit follows those requirements. You have to be a particular kind of person to buy a house by a train track because very few people can deal with the constant rattling and noise of the trains steaming past at all hours of the night. These kinda people will also have to deal with the fact that their balcony could be ripped off at any moment by one of these incoming trains – well, the people in this house will have to, anyway. 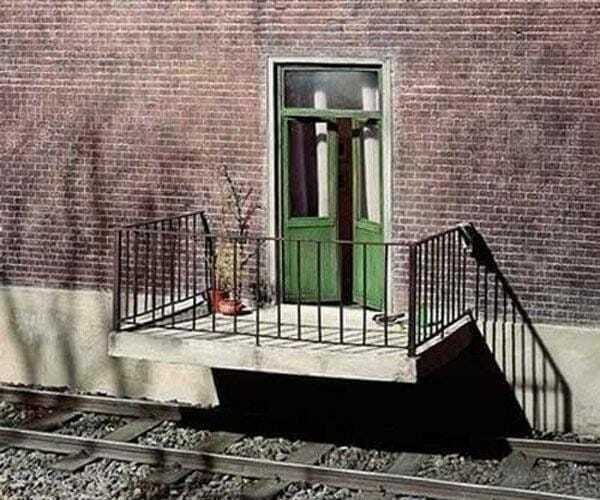 Yep, this piece of balcony construction makes absolutely no sense whatsoever, but at least there is a door this time. Have you ever seen one of those movies where a character opens a door to an empty abyss below? The wind blows around them, the ground has fallen beneath them, and they’re suspended in the air. Always looks pretty scary, right? Well, there are some people who have to live like that on a daily basis – and we certainly don’t envy them. We really hope this is a spare door that is constantly locked, rather than their front door, as that could be a little problematic. 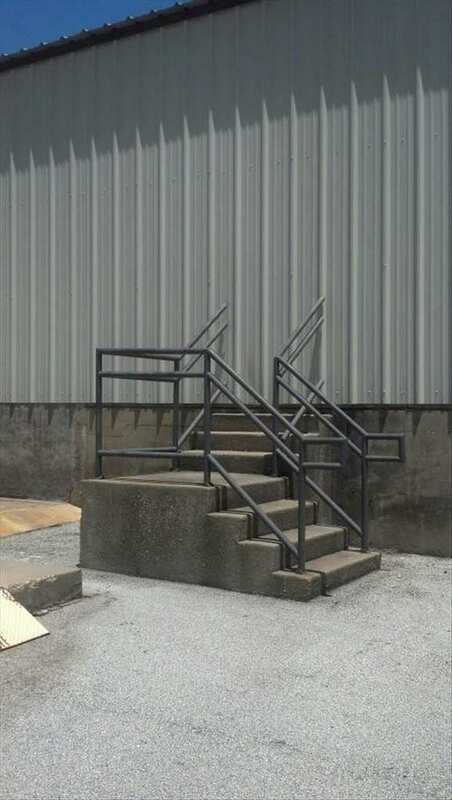 If you cast your memory back to being a kid (ahhh, those were the days), you’ll probably remember when your dad or uncle would pretend to walk down imaginary stairs. Sure, you knew it was pretty lame – but it was still pretty entertaining. Okay, so we don’t pride ourselves on being construction wizards, but we do know that the main aim of having a driveway is that you can drive your car into it. However, that would be pretty difficult on this driveway, unless you had a tiny smart car or could stretch your car like The Knight Bus in Harry Potter (cor, we wish). 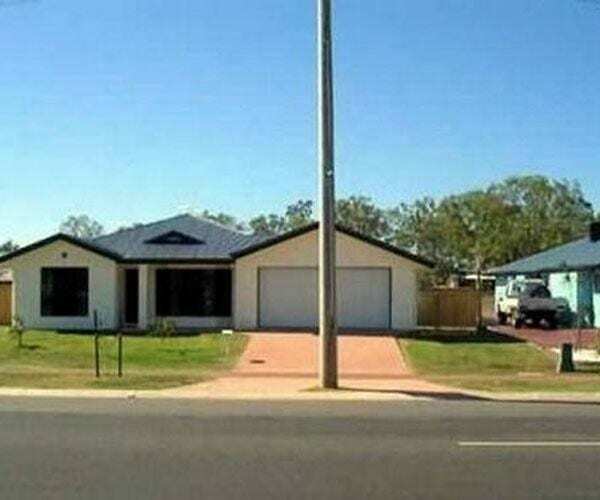 We’re not sure how many people would buy this house and the telephone pole that seems to come with it, but it’s fair to say they’d need to be bicycle owners. If there’s one thing we love more than construction fails, it’s when members of the public recognize these fails and react to them in hilarious fashion – like this guy. 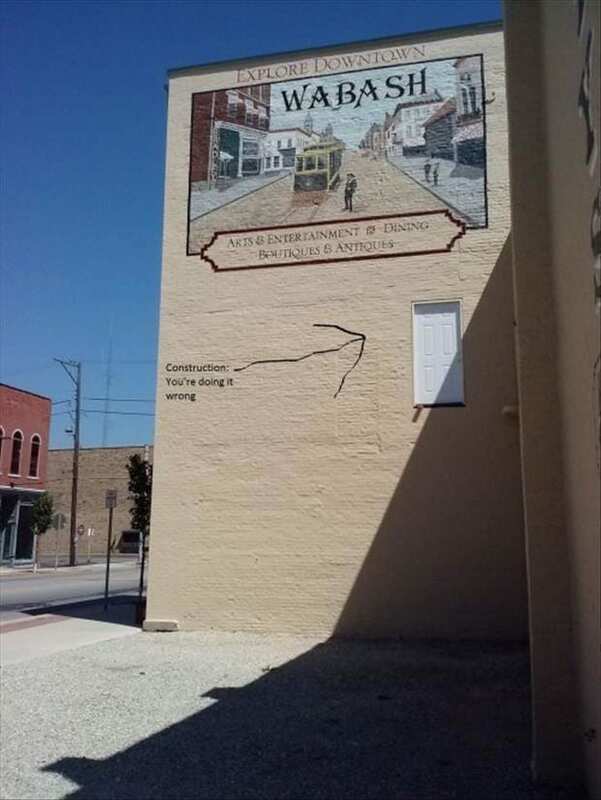 Of course, this door is totally useless unless you’re a giant or have a huge ladder to hand, but we have to admire the guts of the graffiti artist who has still managed to get up that high to deface the wall with their accurate (and marvelously funny) reaction. Well, it is true. You ARE doing it wrong. We all know that trying to cross the road isn’t the easiest thing to do – and it’s even worse if you’re visually impaired. 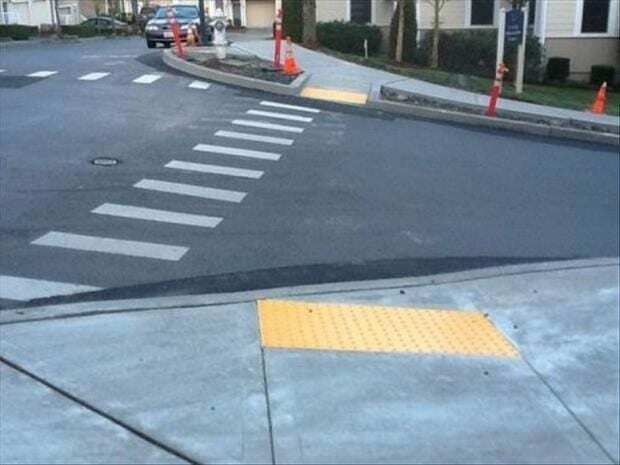 Thankfully, American crossroads have been decked out in awesome textured yellow squares, so these visually impaired people know where to cross and where the crosswalk is. Let’s be honest, this hotel is a little different (and by different we mean wonky) and there are some people who will be put off by this fact, but we bet there are others who will pay hundreds of dollars to stay in the room with the wonky window (because people are weird). 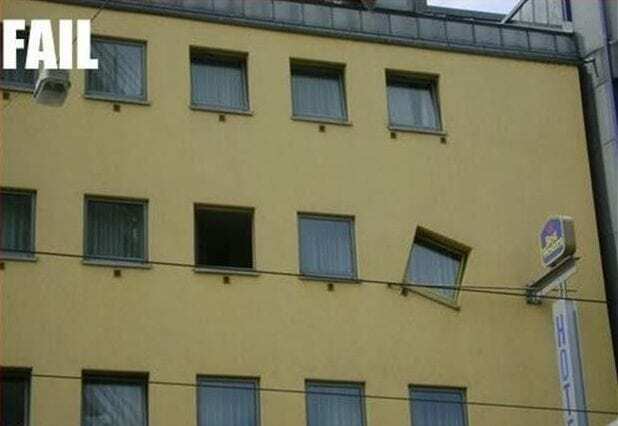 There is a small chance that this wonky window was the result of a modern art project gone wrong, but it’s more likely that the construction workers were following a botched blueprint from an intoxicated architect. 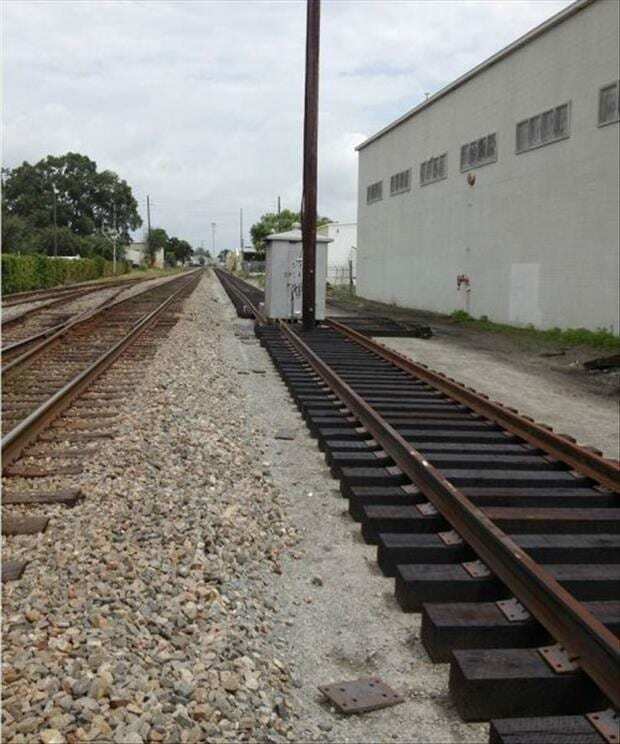 At first glance, this construction project is pretty laughable – and really doesn’t work. Whether these guys are still waiting for a ramp to connect their garage to the ground or whether they’re just going to leave it like that, we’re not sure. However, we reckon this garage was built by a Blade Runner fan in preparation for 2019 – after all, we’re supposed to have flying cars by then! This guy is prepared. This guy is a visionary. We dig that. 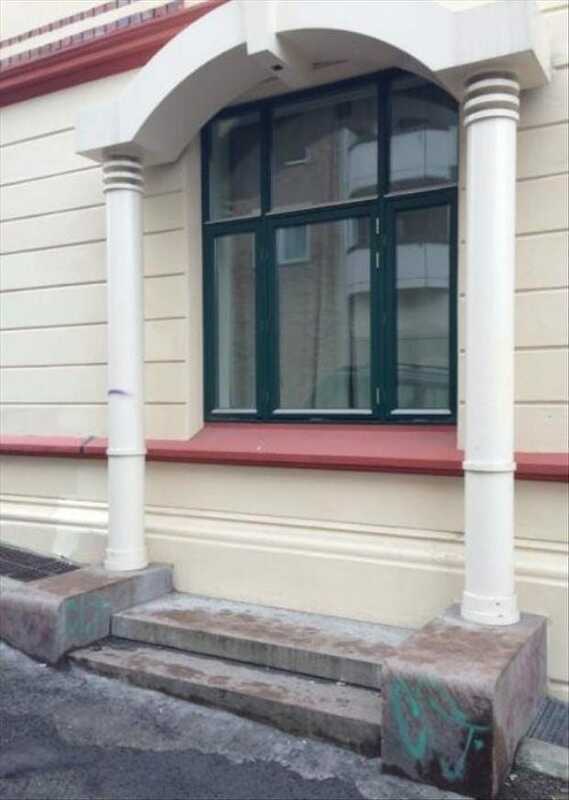 Okay, this construction fail makes us feel really sad. Imagine if you started working at this office, and you wanted to take a little break to take peek out of the windows and look upon the beautiful landscape below…to find your view blocked by a wall. We’re not sure what’s shocked us more – the fact that someone has actually bought blinds to cover a non-existent wall or the fact that they closed the blinds to make it seem even more realistically. Either way, it’s pretty mean. 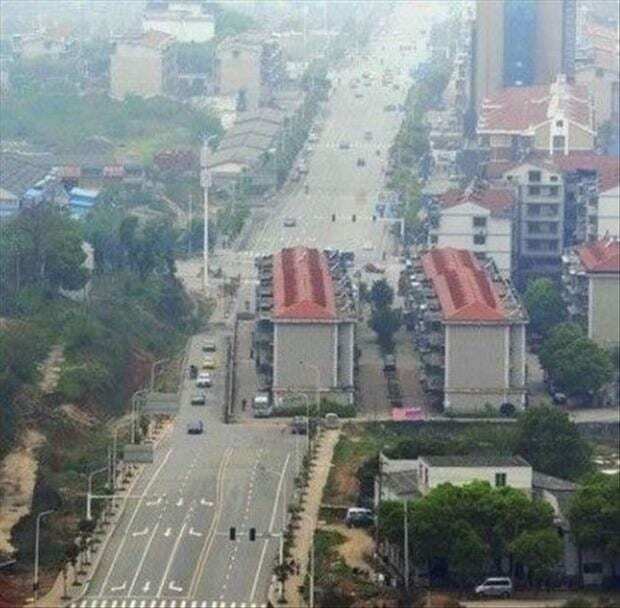 Although many of these construction fails make us cringe, we have to give this construction worker credit for their stroke of genius. 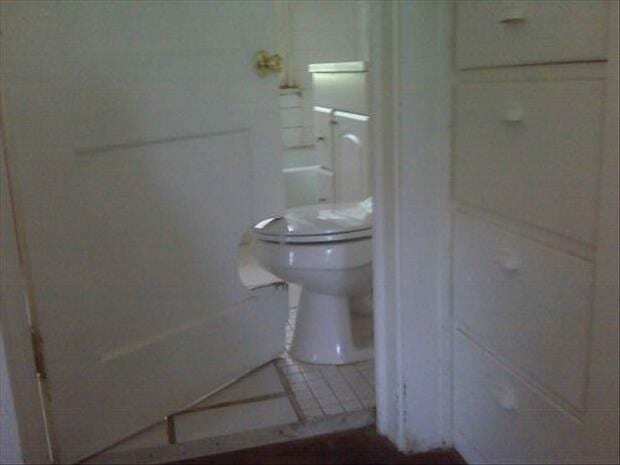 Sure, he definitely shouldn’t have installed a toilet right by the door, but at least he realized his mistake and tried to rectify it. After all, we’d rather be able to close the door and have our legs on show than have to keep the whole door open while we go for a number 2. You gotta work with the space you’ve got, guys. We don’t know what they teach at train conductor school nowadays, but we’re pretty sure they don’t teach drivers to traverse themselves, the train and the rest of the passengers around a giant pole and electricity box. In fact, we think it’s downright impossible. Alright, so we have a few questions for this one because we really don’t get it. For starters, why is that sink so ugly? 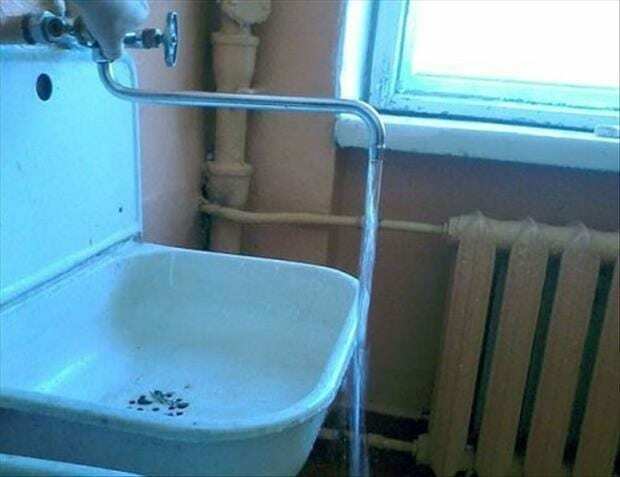 And why is that faucet so darn long? Obviously, this (ridiculous) length is the main contributing factor to the slightly problematic situation at hand. Sure, you can still clean yourself up, but you’ll probably make even more of a mess on the floor in the process. Let’s hope the owners of this house rip the whole thing out soon and start again. We think that’s best. 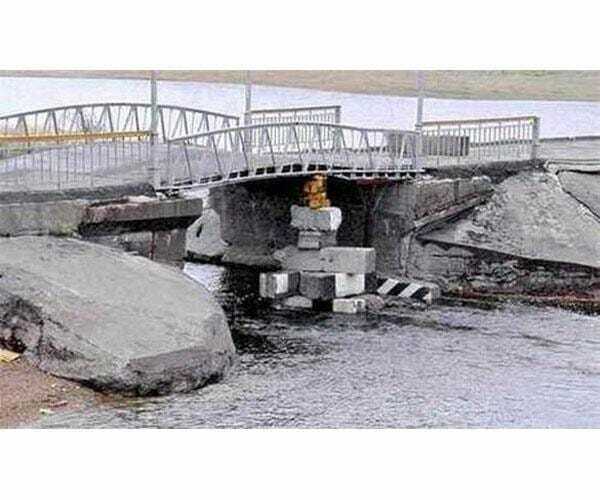 Although we’re not at the top of our bridge-making game (well, not yet) we do know that a bridge should definitely NOT be propped up by a pile of rocks – especially when they don’t look too stable. Nope, there is no chance we’d ever drive or even walk over this bridge, and we think that whoever worked on this thing should definitely get a good talking to. Our advice? Rip the whole thing down and start again, please! 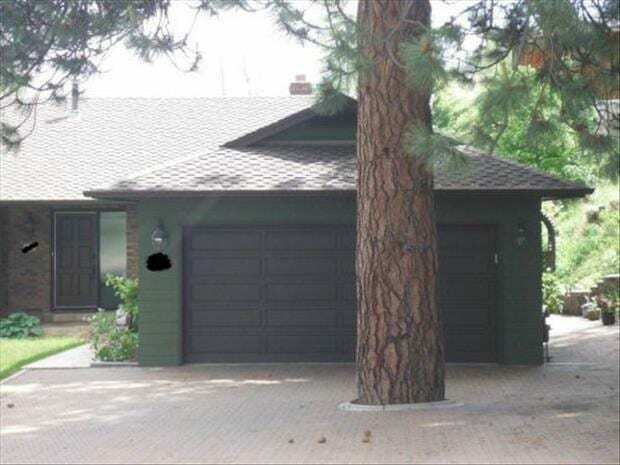 If we’re being totally honest, we think it’s clear to see that the tree was definitely there before the house was built – but why would anyone design and build a house around a tree?! It doesn’t take a genius to realize that it’s going to be problematic. 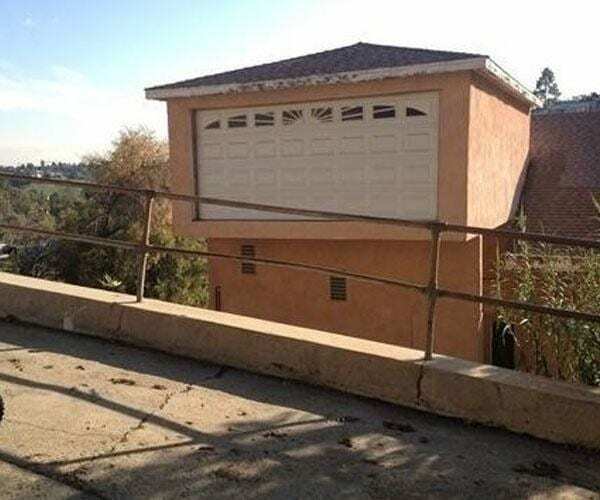 Although these homeowners knew this when they bought the house, we do wonder how they get into their garage. Do they have a really tiny car? Do they slide beside it? And more importantly, does this tree have a parking permit? 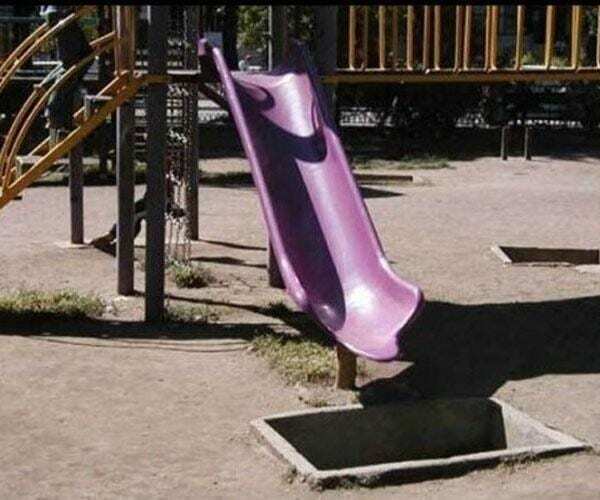 In a day and age where kids aren’t allowed to eat Kinder Eggs or even have fun thanks to new health and safety laws, it’s amazing to see this playground in the depths of America. Yep, that is a rickety slide with a giant pit underneath it. However, if you look closely, you’ll see a few more of these pits scattered around the area! We’re not sure whether these pits go to a cooler underground playground, but we think it’s more likely that these pits are literally just dark, deep and damp holes in the ground. Nice. Yep, we’re totally obsessed with Harry Potter – and we’re totally okay with it. As intense Potterheads, we were pretty upset to discover that we hadn’t received our owl on our 11th birthday and couldn’t take the Hogwarts Express from Platform 9 ¾ in September. But that doesn’t mean we won’t try anything to get into the Wizarding World. It seems we’re not alone, either, as these construction workers tried building the stairway to Hogwarts in this building. Wonder if it worked? We argue with our significant other at least once a day because they left the toilet seat up. Most of the time, they have absolutely no excuse for their actions (no matter how hard they try to make one up) but it’s fair to say that whoever goes in this bathroom definitely does have an excuse for leaving the seat up. 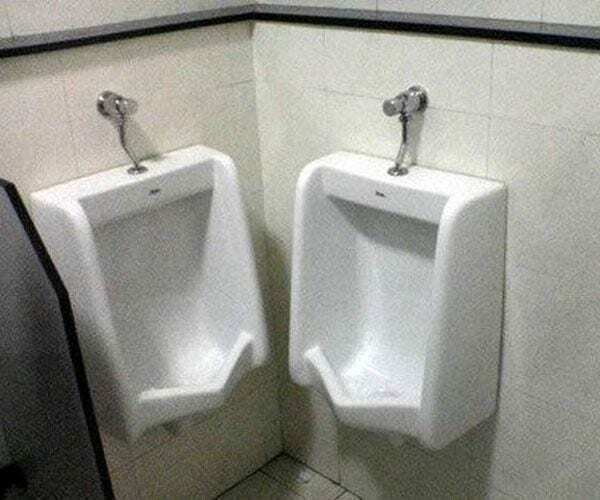 For starters, there is no lid to leave up, because the urinal is so close to it – there is absolutely no space! No wonder it’s so dirty in there. You guys might need to help us out with this one because we have no idea what we’re looking at. Is this a perfectly decorated window that’s been decked out in its own archway and steps? If you live in the city, you’ll know that it can get pretty intense sometimes. There are cars everywhere, there are people everywhere, and there’s construction work going on ALL. THE. TIME.